A guide to flexible serviced offices and office space to rent in London as well as general information that may be useful if you are considering renting offices or workspace in the city. For further London office space information or to search office space for rent in London just click. Or contact us for any office space search query. Perhaps the best known and most important city on earth, London is more than a metropolis, it is a social, cultural and economic beacon. The United Kingdom’s capital is located in the south-east of the country on the winding river Thames, the largest river in the country. Greater London covers over 600 square miles and is made up of 32 boroughs surrounded by rolling hills and copses. It has an oceanic climate, with chilly winters and generally hot summers. The city started life almost two millennia ago as Londinium, a Roman settlement. Founded in 47 CE, the settlement lasted less than 20 years before being burnt to the ground during a revolt by Queen Boudicca of the Iceni Tribe. However the town was rebuilt and by 200 CE had a population of over 60,000, most of whom made their living from fishing or trading. After the departure of the Romans, London came under constant attack by the Vikings. This lasted until 886 CE when Alfred the Great defeated a Viking army. With the unification of England in the 10th century, London became the most important city in the country, followed by Winchester. After the Normans successfully invaded the country, William Duke of Normandy built the famous Tower of London and Westminster Abbey. By 1300 the city had a population of approximately 100,000. Gradually London increased in importance until it was the largest and busiest port in northern Europe. However, in 1666 the Great Fire of London decimated much of the city, with rebuilding to take the next decade. During the 19th and early 20th centuries, London was the largest and wealthiest city in the world. Its infrastructure expanded, the famous London underground was built and the city continued to prosper. During WWII London was heavily bombed by the German Luftwaffe, inflicting high casualties and widespread damage. During the 1960s the city became a centre of youth culture and was known as swinging London. Later in the 1980s, the city acquired its continuing reputation as a financial hub. In 2012 the city successfully hosted the Summer Olympics, cementing its reputation as arguably the greatest city in the world. With the sixth largest city economy in the world behind Paris, New York, Los Angeles, Chicago and Tokyo, London is one of the most economically dynamic cities in Europe. The UK’s capital has a large and diversified economy but is mostly known for being an important financial services centre as well as a media and professional services hub. The city’s importance to the UK’s economy cannot be underestimated. It makes up approximately 20 percent of the country’s GDP and has a population of almost eight million. Financial services is the city’s largest industry, with most companies being located in The City, also known as The Square Mile, an area of central London. London became a largely service-based economy after WWII and has several advantages that make it ideally suited to this kind of industry. Its location as a central time zone means that it can be a connection between US and Asian markets, and its position in the European Union are major factors. Additionally, English law is the most commonly used form of contract law between businesses and the city also benefits from low taxes on foreign companies. More than 85 percent of London’s population works in the service industries with the rest working predominantly in manufacturing and construction. After services, media is the second largest industry in London. The BBC is a major employer and most of the UK’s national newspapers are based in London. London is one of the premier tourist destinations in the world. 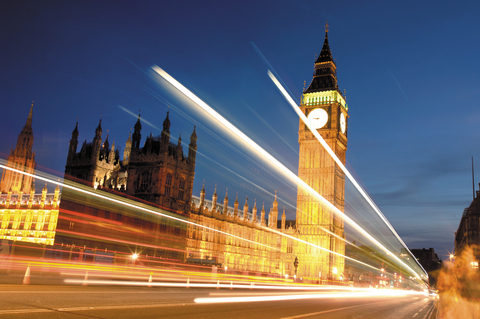 The industry employs over 350,000 Londoners who cater to the approximately 14 million international visitors annually. Every year, tourists spend over GBP 15 billion as they explore the many activities and sites the city has to offer. London has a range of popular attractions with some of the most popular being the Tower of London, the British Museum, Tate Modern, National Gallery, London Eye, Madame Tussauds, the National Maritime Museum and the Natural History Museum. Many visitors also like to walk along the banks of the Thames and see the Houses of Parliament and Big Ben. The city is also known for its famous restaurants, clubs and pubs. Areas like SoHo, Hoxton, Camden and Mayfair are known for being lively and exciting centres of entertainment and relaxation. Some of the most widely known symbols of London are its black cabs, red phone boxes and red double-decker buses. Residents of the city are known as Cockneys and have a distinctive accent and patois all their own. Recently London hosted the 2012 Summer Olympics, a sporting spectacle that attracted hundreds of thousands of visitors and truly put the city in the spotlight. London has one of the most extensive and efficient transportation systems in the world. There are several airports located around the city, the largest of which are Luton, Heathrow, Stansted and Gatwick. Of these, Heathrow is the largest and serves the most international transport. It is the third busiest airport in the world and handles more international travel than any other airport on earth. The city of London itself is served by a large network of undergrounds trains – the famous ‘tube’, as well as the overground rail system with connections all over the country, and to Paris via the Eurostar train. Londoners also use the many trams, buses, taxis and Ubers that criss-cross the city. Cycling has also become a popular form of transport but can be hazardous due to the city’s poor cycling lanes and busy traffic. London currently has the most expensive office space in the world and an office market generally seen as immune from the vagaries of the local economy. The city boasts a number of areas that bristle with Class A office space. The health of London’s office market has been better, though high demand from the technology, media and telecoms industry, as well as the serviced office and flexible workspace sectors have kept it extremely active and lucrative. 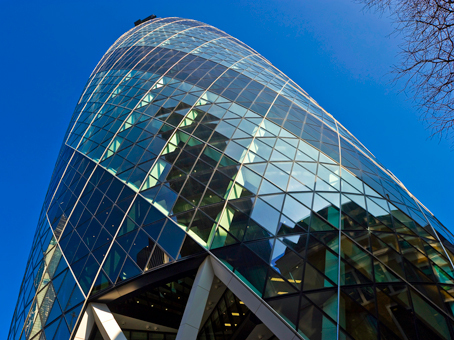 Central London office space is still very popular with investors at home and internationally. Central London has an overall vacancy rate of 4.5%. Central London’s office space markets tend to be broken down into City of London, Canary Wharf and the West End, the latter having several sub-markets. Of the main sub-markets of central London, the West End has seen the most take-up in the last year or so. The area of London known as The City has the most volume of office space in the capital at eighty million square feet. The full year take-up for 2017 was 6.2 million sq ft, and this total was inflated by the flexible offices and workspace sector, which made up for 21% of the take-up. Aside from flexible offices, the sector breakdown was diverse, with major transactions in insurance, financial services and media sectors. City prime rents were stable at £70 per sq ft in 2017 and these have now remained unchanged for a period of two years. Canary Wharf is London’s other financial services centre and is located in Tower Hamlets in the West India Docks on the Isle of Dogs. Currently, Canary Wharf has 14 million square feet of Grade A office space, approximately half of which is owned by property developer the Canary Wharf Group. 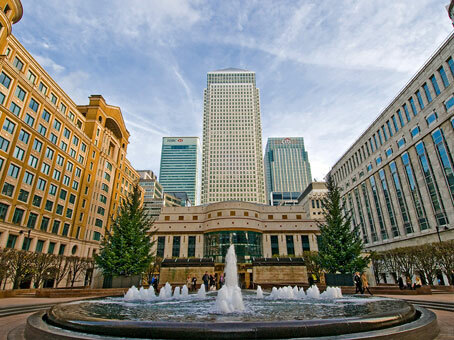 Approximately 90,000 people work in Canary Wharf and it is home to the European headquarters of some of the largest banks and financial services companies in the world including Credit Suisse, HSBC, KPMG and Barclays. 2017 total take-up reached 710,000 sq ft with the pre-let of 270,000 sq ft, Building M7, Stratford City, E20 by HMRC representing a significant chunk of that. The overall vacancy rate increased to 8.9% in 2017, prime rents, for conventional office space, remain at £47.50 per square foot, and pre-let products are being marketed at rents of £52.50-£57.50 per square foot. When Londoners refer to the West End they generally mean the area of central London located to the west of Charing Cross. The West End is currently one of the most expensive areas in the world to rent office space. 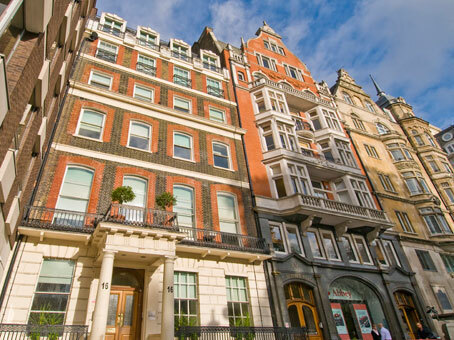 Included in the West End are the distinctly up-market districts of Mayfair, St James’s, Belgravia, Knightsbridge, Covent Garden, SoHo, Chelsea and Westminster. Mayfair, in particular, has always had exceedingly high rents and has some of the most successful hedge funds in the world based in the area, as well as many other high-profile occupiers. 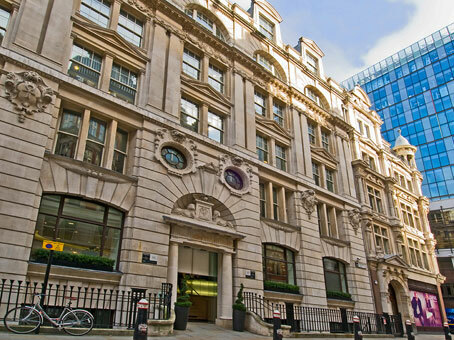 The Media and Technology sector continued to lead January 2018 take-up, accounting for 56% of take-up, followed by the Serviced Office sector at 18% – a notable deal being i2 Offices taking 21,000 square foot at 33 Cavendish Square, and the Insurance & Financial Services sector at 10%. The prime headline rent in the West End is circa £120 per square foot per year although £175 was achieved in a small deal in October 2017. For further general information on corporate office space in London, managed offices in London and co-working space in London, click the links. London has a vast selection of business travel accommodation options and we have partnered with Booking.com to bring you all of these in one place.